Feeding our show livestock projects becomes second nature as soon as we get those animals home and in our own barn. We know they need to be fed twice a day, 12 hours apart, and most importantly, they need a constant supply of fresh, clean cool water. However, the ingredients in the feed pan all play a vital role in your animal’s performance and long-term success. With all species, the balancing of the nutrients is the most important consideration. Although many new products are constantly introduced promoting that they will make your animals the “greatest,” sticking with the basics and making sure your animal gets the necessary mix of nutrients is the key. “The thing we need to keep in mind is that a balanced ration is critical. That’s why we rely on nutritionists to help balance these rations and formulate these feeds to meet the animal’s daily requirements and use complete feeds,” said Blaine Rodgers, Show Livestock Business Development & Field Support at BioZyme® Inc. The essential nutrients that every animal requires include protein, energy, vitamins, minerals and water. The form that those nutrients will take will fluctuate based on the specie you are feeding, the feed resources available to you and where you are in your project. However, all the ingredients in that pan have this in common – if the right combination of ingredients are mixed together and fed at the right time, they should maximize the genetic potential of the animal and help it excel in the showring. In order to maximize the genetic potential of your show livestock projects a sound nutritional program is essential. While every ingredient plays a specific role, they must all work together to accomplish their jobs, therefore having the balanced ration is of upmost importance. Let’s look at the ingredients in your feed pan and their roles. There are many sources of protein available. Soybeans are readily available in most geographic areas and are cost efficient. Protein is essential for animal growth and lean, muscle shape. Most energy will come in the form of carbohydrates like cereal grains such as barley, corn or oats. Other carbohydrates might include coconut oil or milk fat. Energy through the use of carbs is used to get your show animal into the proper condition while promoting growth. Although all other ingredients have naturally occurring vitamins and minerals, it is necessary to add vitamins and minerals to your animals’ diets to make sure they meet their daily nutritional requirements. Vitamins and minerals not only keep your animal healthy, some like biotin and zinc promote skin, hair and hoof health, all vital to your animal’s success in the show ring. Providing high-quality digestible fiber for ruminants is necessary to help maintain their digestive function. Make sure to provide good hay or forage. Other fibers like beet pulp, soy and cotton-seed hulls are good fiber sources. 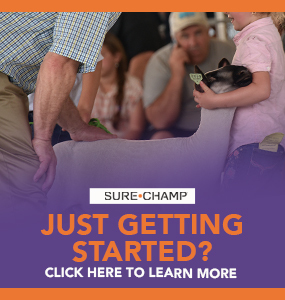 Sure Champ is a nutritional supplement that contains Amaferm®, a precision-based prebiotic research-proven to promote feed and water intake, by increasing digestion and absorption. In addition, research shows that Amaferm decreases body temperature in heat-stressed animals. 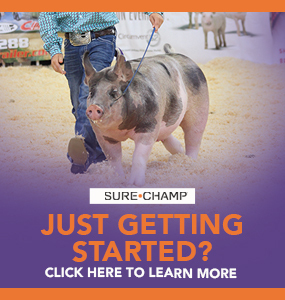 Sure Champ is available for cattle, sheep, goats and hogs, and also contains biotin and zinc for skin, hair and hoof care. “If an animal has the genetics to excel, nutritionally we can help them excel. We can help them maximize their genetic potential if we provide them a high-quality, balanced diet more than if we deplete their nutritional plane. 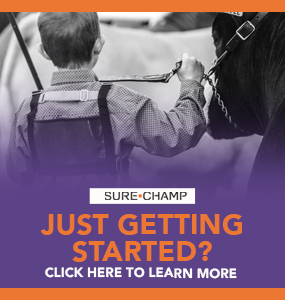 That’s where absorption using a product like Sure Champ becomes so important because if we provide those high-quality ingredients, we want to ensure the animal is able to utilize all of them. 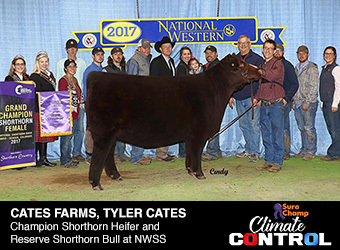 This will ensure those animals will exhibit their genetic potential where the owner will get their bang for their buck for buying quality genetics,” Rodgers said. Next time you fill your animal’s feed pan, think about the ingredients you are putting into it. Are you scooping some corn and oats? Or are you packing that pan with the protein, carbs and minerals that your animal needs to reach its genetic potential? 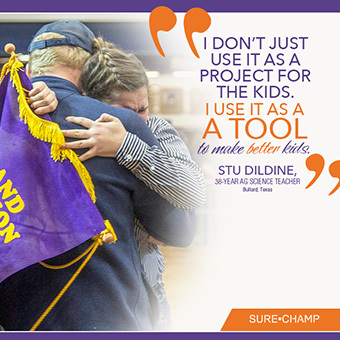 Either way, be sure to include Sure Champ in your animals’ diet to help absorb the nutrients and get the most bang for your buck, while you are prepping to win. Sure Champ. EVERY. DAY.